Need Backup & Sync software for Portable HDD. Discussion in 'PC Hardware and Software' started by dbg, Sep 7, 2012. So I have got a Laptop with 1TB HDD & WD Elements 1TB USB 3.0. I am looking for an automated backup & folder sync solution with which I can backup my media files & downloads onto my Portable HDD. Here's the scenario I'm looking at. 1. Just plug in the Portable HDD into the laptop, the software detects the HDD and automatically starts syncing files between the Laptop & HDD. Alerts when Sync is complete. 2. Software reminds me every weekend to backup my files. Please suggest any free/paid software that can help me do this. Most of the portable HDD's include this kind of software !! what are you finding difficult in this ! JD666, Nicko and dbg like this. harryneopotter, JD666 and ManISinJpr like this. 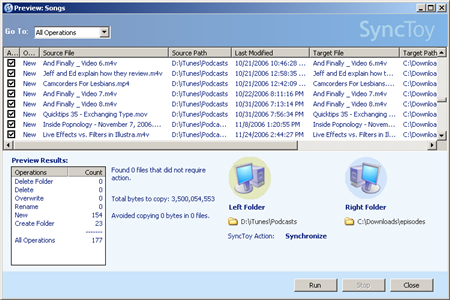 Microsoft Synctoy is a must-have utility to help you synchronize files in different directories of the same computer or between a computer and external storage devices like the iPod and USB pen drives. 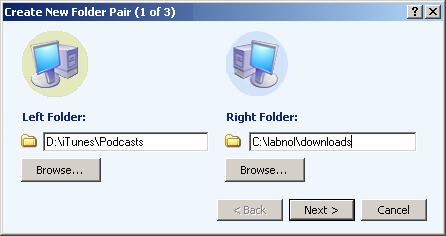 As in the figure above, you first select a pair of folders that you want to keep in Sync via Synctoy. Then decide the action – should the two folders be clones or only the new files have to be copied ? SyncToy supports wild-cards in file names (like *.exe or holiday_*.jpg) so you can decide what files are included or excluded during the sync process. And using SyncToy is completely risk free – it has a wonderful preview feature that lets you see what operations would take place during the run without performing any changes on your computer. *If you were to sync files and folders on multiple computers via the internet, considerFolderShare – it can also sync files between a Mac and Windows computer. Informative. Ill also plan to do something of this sort with my rig. This would be very very useful in the event of a crash.